Prior to my diagnosis of estrogen positive (100%), progesterone positive (3%-m'eh), HER 2 positive (98%) Invasive Ductal Carcinoma (Breast Cancer) I had not a care in the world about the ingredients in the products I used in my household nor on my body. I also gave little thought to the ingredients in the foods I consumed. I love cakes and ice cream as much as I love spinach and sweet bell peppers. What's wrong with that, right? I got a nice balance going on. Or so I thought. We all recognize that cakes and ice cream are loaded with sugars and carbs and fats that should be enjoyed in serious "moderation" doses. Especially, if you are like me: overweight/ teettering on the line of clinically obese with a BMI of 29.8. (Here's a good place to plug that since diagnosis I have lost 9 pounds thanks to cutting out sodas and drinking copious amounts of water daily as well eating better--YAY!) The dangers of junk food is pretty much all preached out. I think everyone gets it. But what about the dangers of the healthy stuff? The fruits and vegetables? Many of you are probably screwing your face up and have strong thoughts to move on from this post, but I implore you to hear me out. I used to have the same reaction, "People are crazy! All these conspiracies! 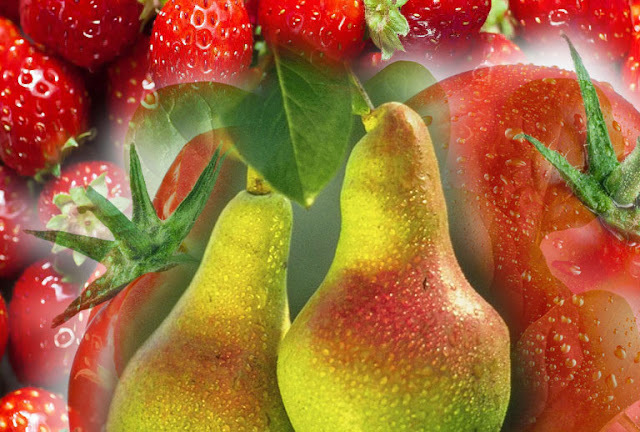 Fruits and vegetables are good for you!" Well, turns out that the use of pesticides and fungicides potentially turn that last sentence into a falsehood. The mimicking one-1st bullet-- is my chief concern. The cells that this breast tumor is comprised of all have receptors for estrogen and thrive and proliferate when estrogen binds to its corresponding receptor... or when something that seems like estrogen binds. Estrogen overstimulation??.. Clearly, I have a problem. What I found out in the search of hygiene products I use everyday is that lotions, face wash, soap, and deodorant all have to go! They all contained ingredients that known to be toxic to organs (via absorption) and disruptive to the endocrine system. I was hard-pressed to find any of my makeup on the naughty list, but surprisingly, (and thankfully), none made it. I placed an order with Bubble and Bee Organic yesterday to replace my daily-use deodorant, soap, face lotion and cleanser. I will give a review on these products in a few weeks. And then in addition to foods and health and beauty products you have plastic products that pose a threat as well with PVC (polyvinyl chloride) and BPA (bisphenol A) which are both known endocrine and reproductive system disruptors. To lessen your exposure to BPA use glass and ceramic (anything but plastic) whenever possible, especially when reheating and storing foods and avoid PVC products, period. And you know... Many people have and will live very long lives without a shakeup to their health. This population may use whatever products they want and eat what they like with no regard to exposure to harmful compounds. I think that is super cool. But for me, a current cancer patient, even if one day announced "CURED", I cannot risk it. I cannot risk toxic exposure like I'm not especially susceptible to an ailment such as cancer, like many others that have not fallen victim to this ailment may be willing to do. 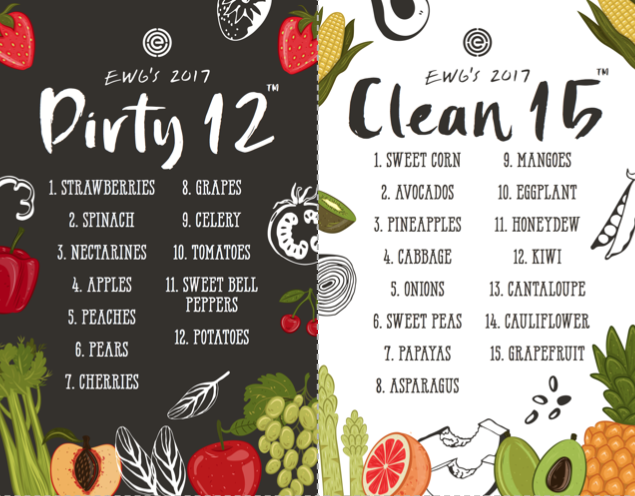 I'll close this post with EWG's 2017 lists of the dirtiest (most harmful) and the cleanest (least harmful) produce; though there is a minor update that didn't make the visual: Pears are #6 on the Dirty side. Don't know if that means we now have a "Mean 13" or if the list remains "Dirty Dozen" with potatoes dropping off. Either way, I'm keeping all 13 in mind and avoiding what I cannot peel all together. No wonder I cringed as I sat in line at the local Walmart recently watching an elderly man rest leisurely on his cart as he ate dusty grapes fresh from the produce section.